Recent studies suggest that dark matter out weighs ordinary matter by a factor of seven. (Reference 1) Although dark matter cannot be seen directly through a telescope, it reveals itself to astronomers by its strong gravitational pull on nearby stars and gas, and even galaxies. Both of these results are expected if the galaxies are nestled within clumps of dark matter. (Note 2 and 3) The SXDS team compared the observational results in detail to theoretical predictions based on a Cold Dark Matter model by team member Takashi Hamana (Reference 3) and found that the average clump of dark matter nests weighs as much as six hundred billion (600,000,000,000) Suns, and that a single clump of dark matter harbors multiple young galaxies. 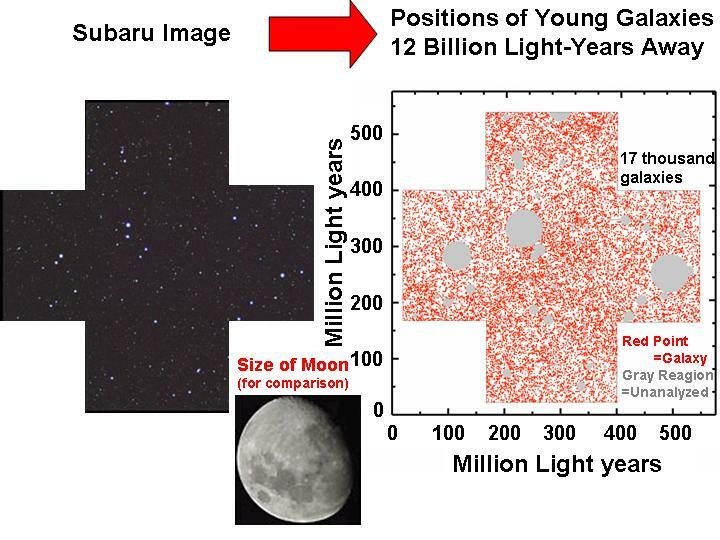 Independently, Nobunari Kashikawa from the National Astronomical Observatory of Japan and colleagues also used Subaru's Suprime-Cam camera to study an area of sky in the constellation Coma Berenices (Berenice's Hair) called the Subaru Deep Field (SDF; Reference 4). This field is only the size of one full moon but the data available are twice as sensitive as the SXDS field data. The SDF team found about five thousand (5,000) young galaxies at a distance of twelve billion light years (Figure 4), and eight hundred (800)even younger galaxies at a distance of twelve billion five hundred million light years. The SDF team was also able to double check the identities of the young galaxies by taking spectral data of the galaxies with the Subaru and Keck telescopes. 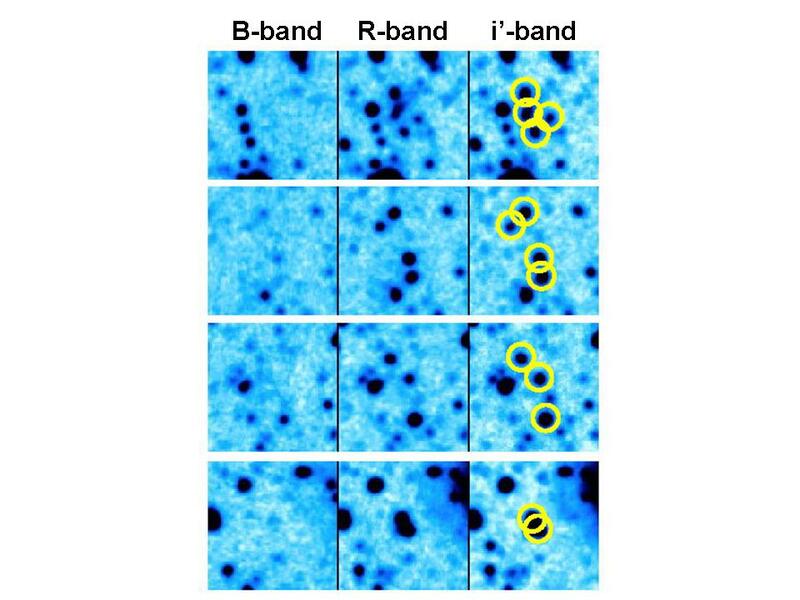 The SDF team independently obtained the results 1)+2) described above, and concluded that some single clumps of dark matter harbours multiple young galaxies. 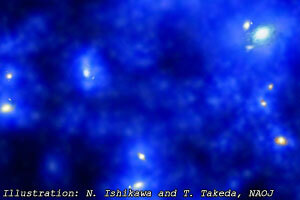 In the SDF images, it is possible to see several new born galaxies huddled together in a small area. 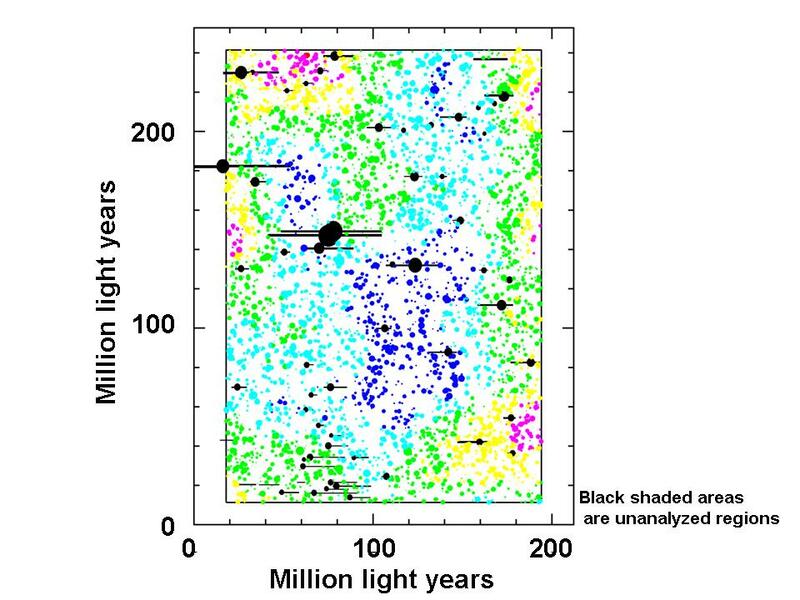 (Figure 5) By comparing the SDF data in detail to high precision computer simulations of the growth of clumps in Cold Dark Matter by team member Masahiro Nagashima of Kyoto University (Reference 5), the SDF team concludes that heavier clumps of dark matter have more bright galaxies, and that this preference produces the correlations found in real observation (Note 4). 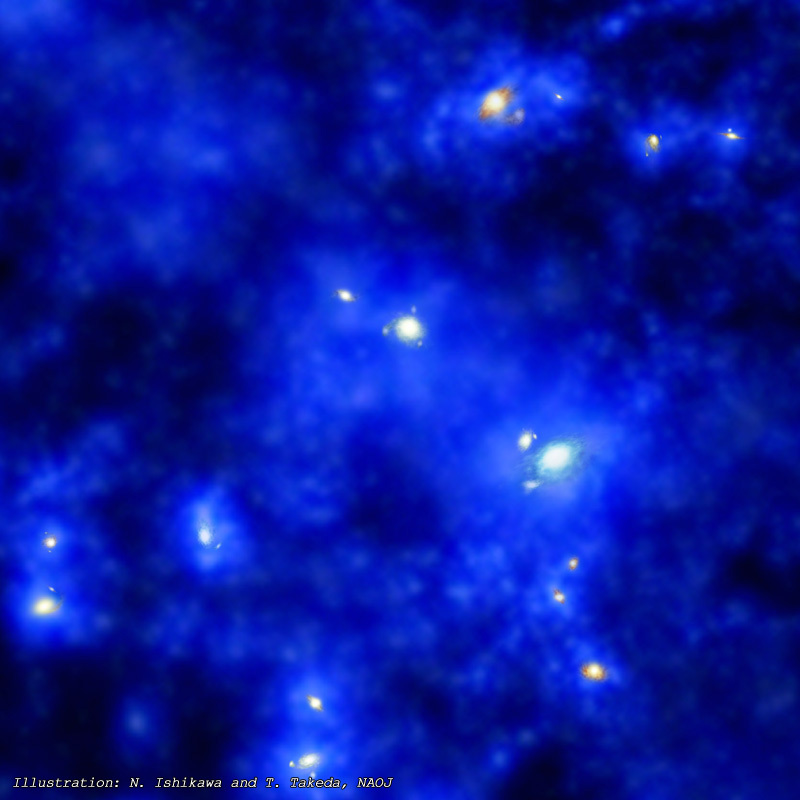 The two teams together have found the first concrete evidence that young galaxies in the early universe (Note 5) are nestled within clumps of dark matter, and that a single clump of dark matter nurses several young galaxies. Both teams took advantage of the Subaru telescope's unique ability to take deep sensitive images over a large area of sky. Results from the SXDS team were published in the December 20, 2005 edition of the Astrophysical Journal (Reference 6). Results from the SDF team will be published in the February 1, 2006 edition of the Astrophysical Journal (Reference 7). Note 1: Figure 3 is a graph of the correlation coefficient which shows the strength of the clustering of galaxies at different separations. The horizontal axis shows the distance between a pair of galaxies. The vertical axis shows how many galaxies are separated by a particular distance. A correlation coefficient of zero means that galaxies are distributed randomly. In figure 3, galaxy pairs of separations of up to one hundred million (100,000,000) light years have positive correlation coefficients. This indicates that galaxies are clustered together up to distance scales of one hundred million light years. 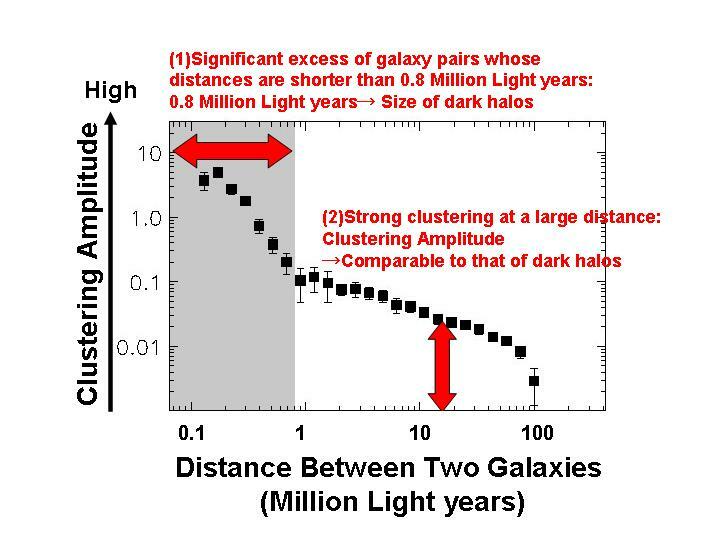 Note 2: Astronomers call clumps of dark matter that surround galaxies "dark matter halos." Note 4: Why do heavier clumps of dark matter have more young galaxies? There are no clear answers to this question yet, but in the framework of the modern scenario for galaxy formation which involves repeated collisions are mergers between galaxies, such correlations between visible matter and dark matter are very significant. Finding multiple galaxies within a single halo is still common at the present era, and has been reported in large surveys of nearby galaxies such as the Sloan Digital Sky Survey (Reference 11). It is worth noting that it is now possible to study such small scale properties even the early universe. Note 5: Light for galaxies twelve billion light years away were emitted twelve billion years ago. This corresponds to a little over one billion years after the birth of the universe thirteen billion and seven hundred million years ago, or ten percent of the current age of the universe.